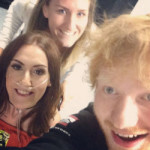 Sheeran invites terminally ill woman Channan Petrides and her friend backstage at Wembley Arena in London to fulfill her dream of seeing Sheeran perform. He was so lovely and genuine, he had a great sense of humour and was really easy to get on with. He signed my programme and we took some selfies together. He smelt amazing. A few months ago, I was so unwell I was worried if I’d ever make it to Ed Sheeran’s gig, but I did and it was incredible and I also got to meet him backstage. My life is now complete.